Energy Crisis! What Happens to America's Natural Gas With Low Oil Prices? 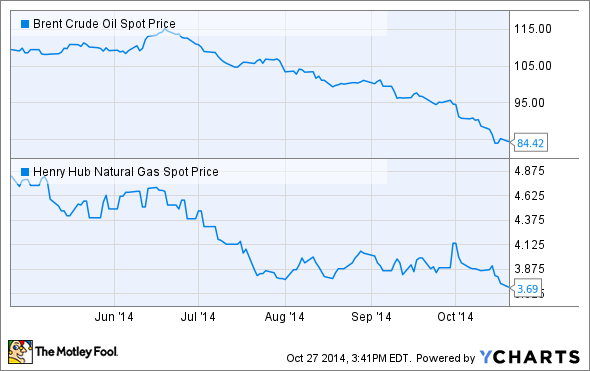 America’s cheap natural gas is no longer cheap thanks to falling oil prices. It really is stunning to see how quickly the energy situation in America has changed over the past few years. Thanks to the combination of horizontal drilling and hydraulic fracturing, American energy companies found the keys to unlocking vast sums of energy trapped in tight rocks. We're now overflowing with oil and gas -- so much so that America could soon go from an importer of energy to an exporter of energy. However, that future is in jeopardy due to the recent plunge in oil prices. As the following chart notes, oil and natural gas prices are well below recent peak prices. This fall in oil prices could put the brakes on our higher-cost oil production growth from shale. However, it could also have an impact on the natural gas industry. Where this impact will really be felt is when it comes to liquefied natural gas, or LNG, which we'd been planning to export to world markets. Because of the link between oil prices and natural gas on the LNG market, it's causing America's cheap natural gas to no longer appear cheap. On the international markets LNG is typically priced by what are called oil-linked contracts. Under this link LNG sells for a percentage of the price of crude oil. We can see an example of this in a recent investor presentation by Cheniere Energy (NYSEMKT:LNG), which is currently building LNG export facilities in the U.S. Under an oil-linked contract LNG would sell for $11 to $15 per MMBtu if the price of global crude oil benchmark Brent is at $100 per barrel. However, with Brent priced crude oil falling to about $85 per barrel, the price for LNG would drop to $9.35 to $12.75 per MMBtu under that same scenario. After adding in the additional costs to liquefy the gas and then ship it overseas, we're looking at much less savings for LNG buyers around the world. In fact, at about $80 per barrel, the discount to rival oil-linked LNG will basically vanish, causing a big problem for future LNG projects in America. Further, there is a substantial amount of natural gas in America that requires higher gas prices before these sources are economical to drill. As the following slide from an investor presentation by Enterprise Products Partners LP (NYSE:EPD) points out, there is a plentiful supply of natural gas, but these supplies aren't economical unless the price of natural gas heads higher. Source: Enterprise Products Partner L.P. Investor Presentation. There is the potential for 24 to 45 billion cubic feet per day of natural gas supplies available once gas prices get over a certain point. That's a lot of gas as each day we could pump out enough to meet the energy needs of 250,000 to 475,000 homes for a full year. However, the driving force that would push gas prices higher to make this gas economical to drill would be demand from LNG exports. The fall in oil prices is making it less likely that this gas will be an economical option for LNG, as even our cheap gas might not be cheap enough any more. So, if LNG demand doesn't materialize it means production growth from higher cost sources won't happen either. That will cost the U.S. the opportunity to create jobs and wealth by expanding our natural gas production to meet worldwide demand. The plunge in the price of crude oil is making waves throughout the energy market. If the price of oil falls any further it could cause the price of LNG produced in America to actually cost more than LNG produced elsewhere due to the added costs from liquefaction and shipping. That could leave a lot of American LNG projects on the drawing board as well as leave a lot of our higher cost natural gas still stuck underground.